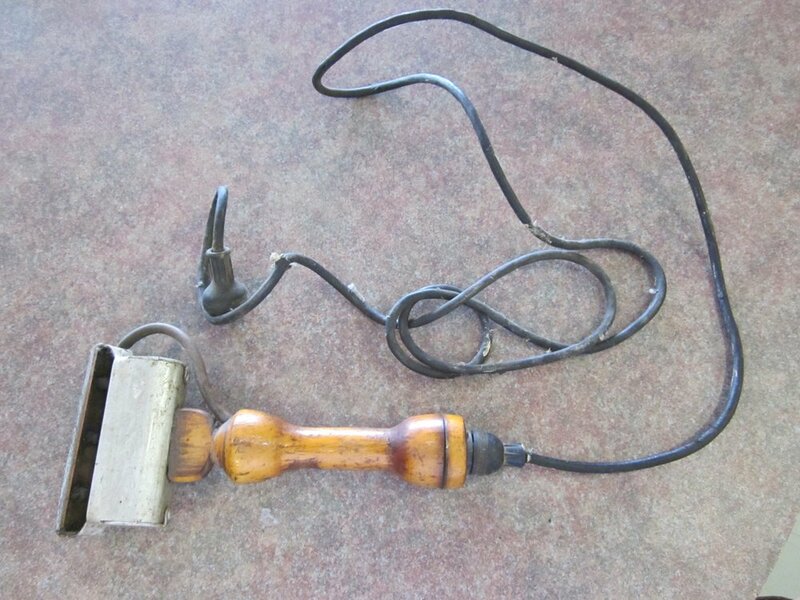 Hand pumped smoker used for calming bees when opening the hive. Made of copper with rubber blower sides in a wooden frame. Small round, domed skep hive with square entrance hole near based. Made of straw strands wound around into shape and bound together.These skeps were more common in Europe, most phased out now due to the problems of keeping clean and difficulties in extraction/keeping the bees over winter. Homemade bee veil used to prevent stings to the head and face when working with bees. Made by Wilbert Hagerman. Cream coloured hive with a red top cover. White paint on the end H. Hagerman. Three supers, each holding 12 wooden frames. Built by Wilbert Hagerman and passed on to his son Harold Hagerman. Used until 1950. Interior of cream coloured hive with a red top cover. White paint on the end H. Hagerman. Three supers, each holding 12 wooden frames. Built by Wilbert Hagerman and passed on to his son Harold Hagerman. Used until 1950. Forearm length left hand glove for working with bees to prevent stings. Exterior is leather and interior is felt with elastic at the opening. Small hand held smoker for calming bees when opening the hive. 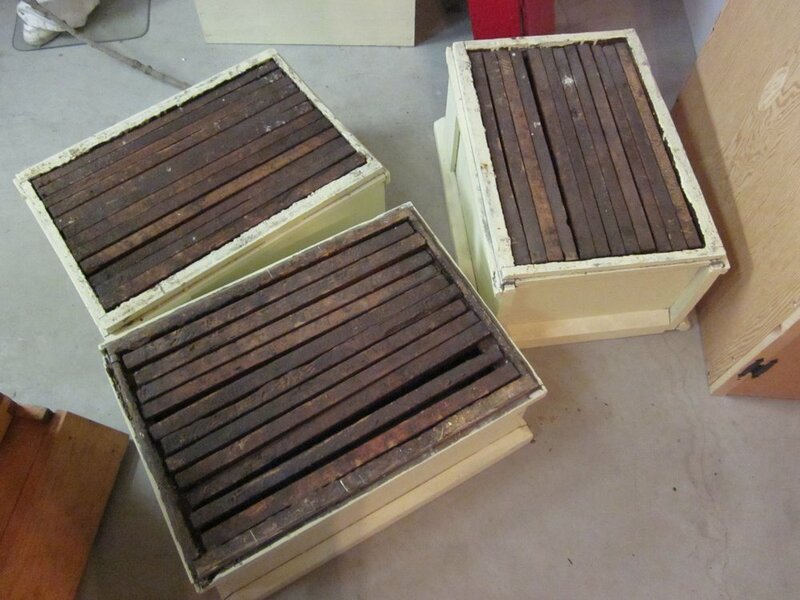 Small wooden and wire queen box used for the shipping of queen bees to beekeepers. Latched at the top for removal of the queen upon arrival. Paper shipping tag with a small round hole punched in the top for attachment. Used full size hive frame filled with wax comb. Comb blackened with age and use. A few small wax spurs in spots on the edges. Homemade vise for holding together hive boxes while the glue in the joints dried. A small jack and handle allow it to be tightened right up to the desired pressure. Hand cranked foundation mill for making new wax comb foundation to go into hive frames. Foundation gives a pattern for the bees to build comb out from to be most space efficient and commercially productive. Red painted wood handle with metal spinning wheel. Used to embed wire in foundation mould by running over the wire. The spurs on the side make slight cuts in the wax which the wire is then forced into. The wire is used to give stability and strength to the foundation. Homemade wooden toolbox/stool combo. Includes several tools for working with hive (scissors, chisel and scraper). Handle hole on the top and loading space on the front. Black base with aluminum painted top. 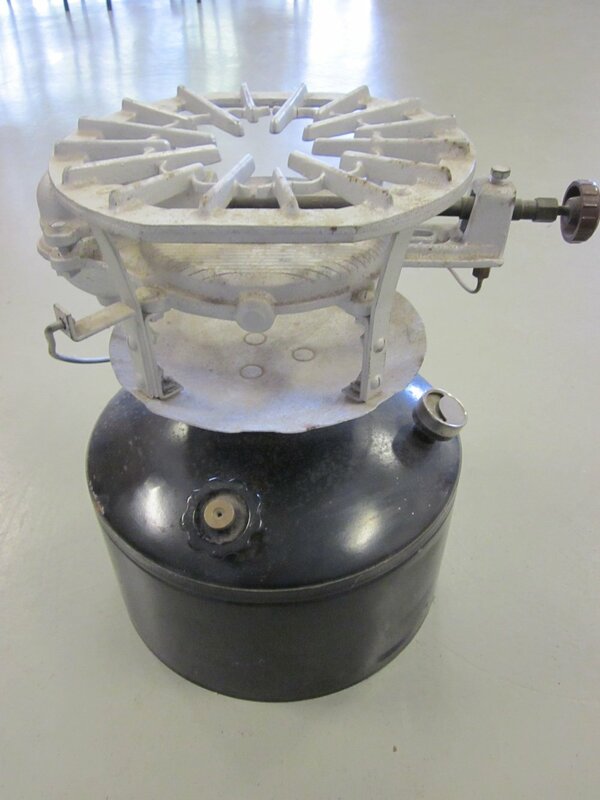 Gas burner used for heating copper pail. Water in pail would then be poured into steam de-capper. 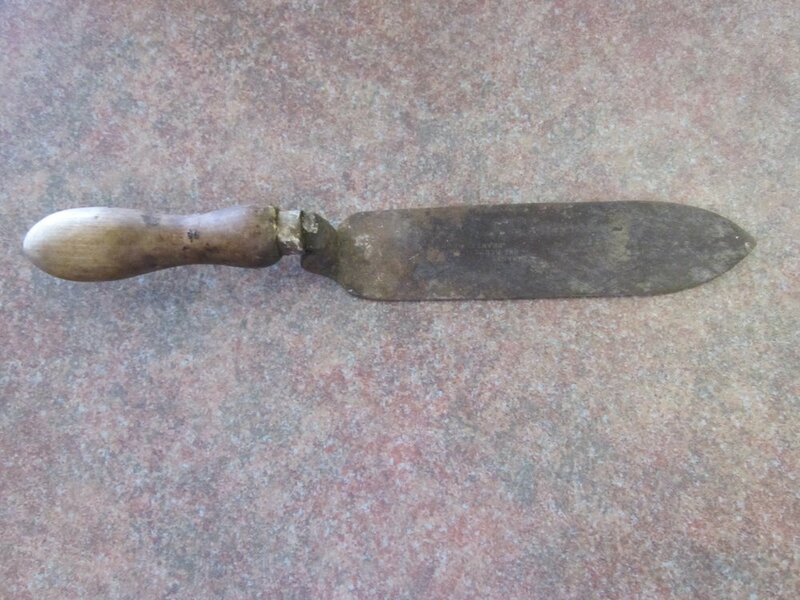 Simple decapping knife for removing wax cappings off honey comb in frames prior to extraction. Hand cranked, four-frame, tangental honey extractor. As handle was cranked, the baskets holding the frames would spin around. The centrifical force would fling the honey out of the decapped comb where it would hit the sides of the drum and slide down to the bottom. It could then be released via the valve at the bottom to be filtered. Four layered filter system for honey. Honey poured int through the top and pulled through the four filter baskets by a vacuum pump on side. Cleans out wax and other particles from the extraction process. Honey drained off at the bottom. Developed at the Ontario Agricultural College. Large metal barrel with a wooden support across the top. Wooden support used to help keep frame upright while uncapping. Wax cappings fall into the barrel onto a removable screen. Any honey in the cappings then flows through the screen where it can be drained off in the bottom. The screen can then be removed to gather up the cappings for melting down. Small cardboard and wooden pail with a wire handle used for storing honey. Printed with a picture of a honey extractor. Warranted Pure Extracted Honey. Stamped on the bottom. Honey tin with a push down top. Blue, yellow and white motifs. 4 lbs 8 oz. Pure honey from the apiary of G. W. Hagerman & Son. RR. No. 3 Stirling ONT. 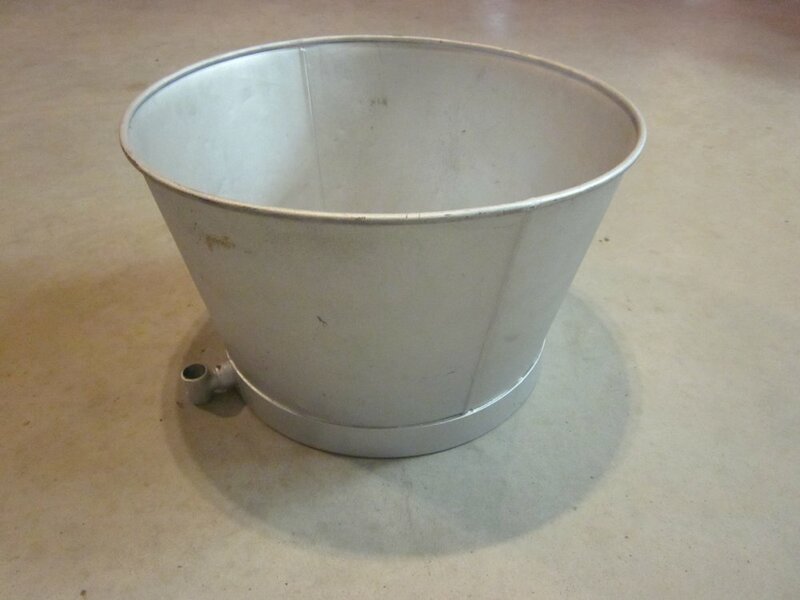 Small round bowl with a spigot for draining honey into bottles or tins. Small classifier kit for honey. 5 sample bottles held in a wooden frame. Samples include; extra white, white, golden, light amber and dark amber. Trading and classifier use information printed on the front. Made by F.W. Jones & Son. Classification kit for honey. Includes Classifying and grading kit booklet, teaspoon, gradulated cylindor, two thermometers and a grading rack of samples. Samples go from water white, extra white, white, golden, amber and dark amber. We have an active bee hive at Farmtown Park. You can watch the bees, learn about beekeeping and about how honey is extracted from the beeswax capping.